It’s has antioxidant protection, meaning that it contains vitamin E. Vitamin E protects the skin from pre-maturing and helps the skin re-store the damage that has happened to it. Doesn’t clog pores which is a big plus. Olive oil penetrates deeply into the skin, which cleanses it. It Enhances exfoliation meaning that, it can also remove dead skin sells and give your skin an all natural glow. Mix all the ingredients together and you should get something like this! Apply it on your face and leave it on for about 5-10 minutes. Rinse it off with cold water because, it helps close pores. 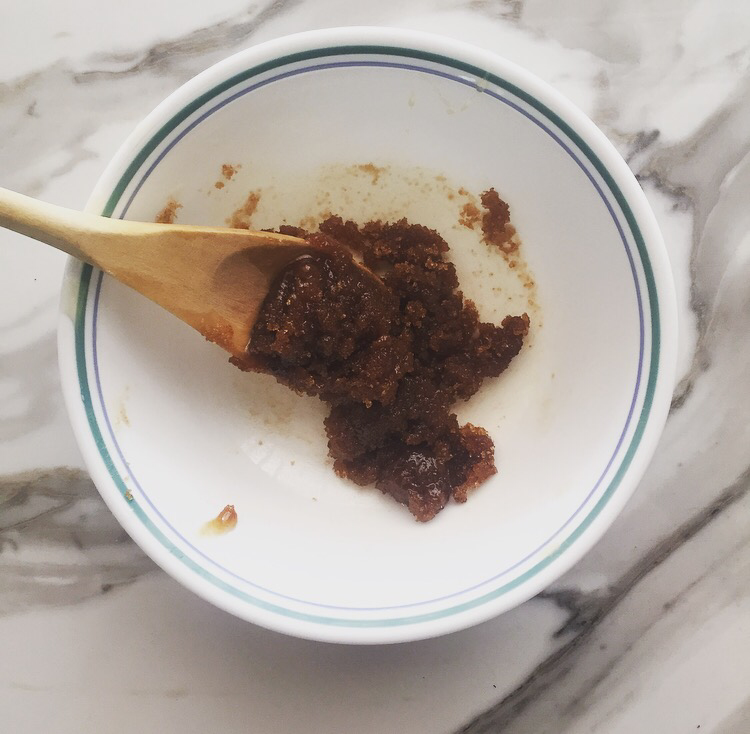 Brown sugar is the absolute best natural use as an exfoliate. It maintains your skin clear and away from breakouts. It can help pores unclogged and clean from anymore bacteria occurring. It also helps removal of acne scars. 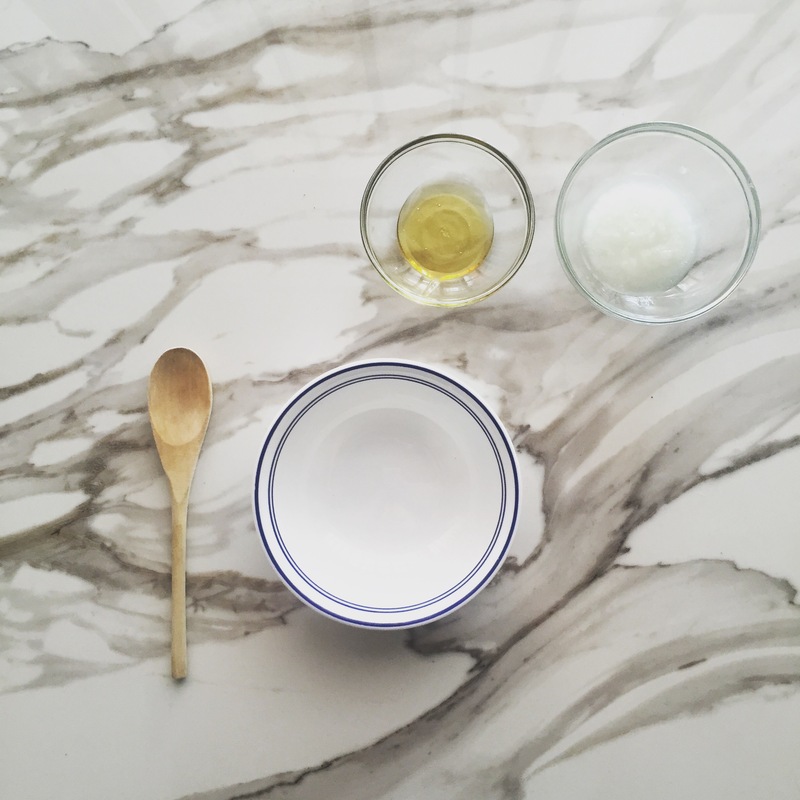 Mix both ingredients together and your facial scrub should look like this. It’s not the most appealing facial but it does the job! Leave it on for 10-20 minutes then, rinse it off with lukewarm water. Coconut oil is my essential for any type of purpose. It smoothens and softens the surface of your skin (especially if you have dry skin) and refreshens your skin as good as new. Coconut oil can heal, hydrate, and break down dead skin cells. Coconut oil penetrates skin pores to soften rough skin from within. 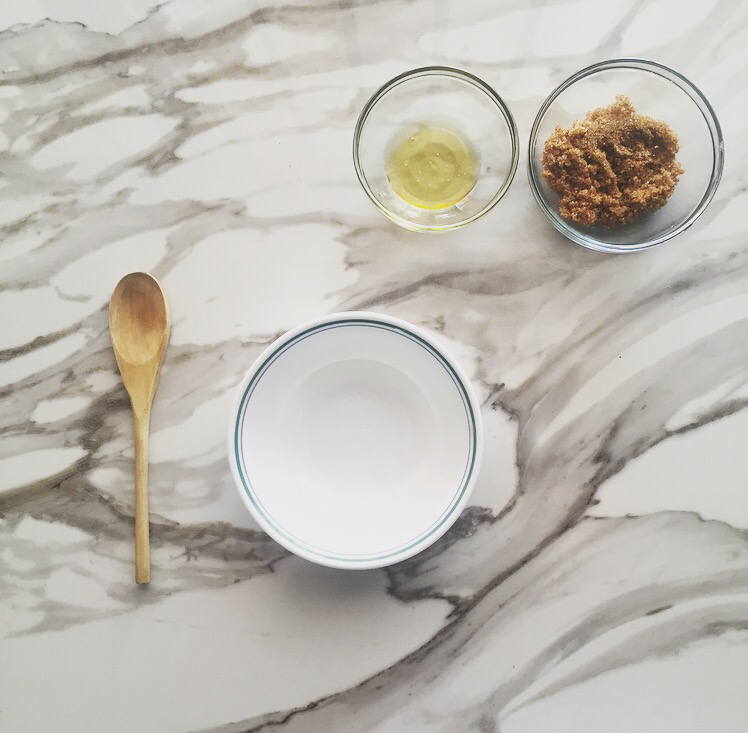 Mix ingredients together and apply on your skin. Leave the mask on for 15 minutes and then rinse it off with warm water. I use all of these facials whenever I feel like I need an extra boost for my skin to get better nourished. If you guys have any questions leave a reply below ! I love trying out different beauty regimens that are not only benefiting my skin more but, completely natural makes it even better. I decided to look around my kitchen, find some natural ingredients that can improve my skin and I also did some research on these ingredients. These ingredients are great for your body inside and out. Salt is perfect to use as an exfoliator. All you need is a small amount, rub it around onto the skin and it removes the dirt thats been carried inside the pores all day and it also leaves the skin soft & smooth. Not only is salt beneficial for the skin but it also is strengthens nails & softens the cuticles. All you have to do is apply salt to warm water and dip your feet/nails in it for about 5-10 minutes. It will improve the overall strength of your nails and skin. If you wake up in the morning with your under eye circles puffed up a bit, ice helps to reduce it. Or even if you have redness around the area of your face just apply a couple of ice cubes for 30 seconds to 1 minute and you will notice how it diminishes puffiness/ redness. I absolutely love using baking soda when I ever decide to make facials. Not only is baking soda great for the skin it also is a perfect substitute for dry shampoo. Just apply a small amount on the oily roots of your hair and you will be good to go. Baking soda also helps whiten teeth by mixing a small amount with water and brushing it onto your teeth after you brush your teeth with toothpaste. Similar to using ice, cucumbers are also great to reduce swelling, puffiness, dark circles and brightens the skin by just applying a slice of cucumbers on each eyelid. Plus, if you ever get a really bad sunburn, cucumbers reduces redness, itchiness and adds a cooling sensation to help the pain. Lemons are another one of my favorite natural ingredients to use on my skin. Lemons contain vitamin C and has fruit acids that helps to brighten the skin and evens the tone of your skin. If you have really bad acne scars or just un-even discoloration on the skin by using lemon juice with a bit of water improves your skin. 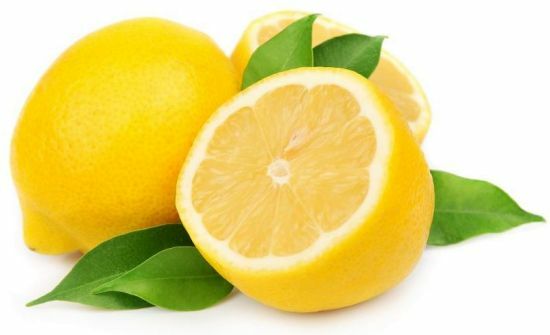 Lemon can also be applied to the hair and scalp for dandruff relief. Coconut oil is probably the ultimate ingredient that can be used for any type of beauty purposes. 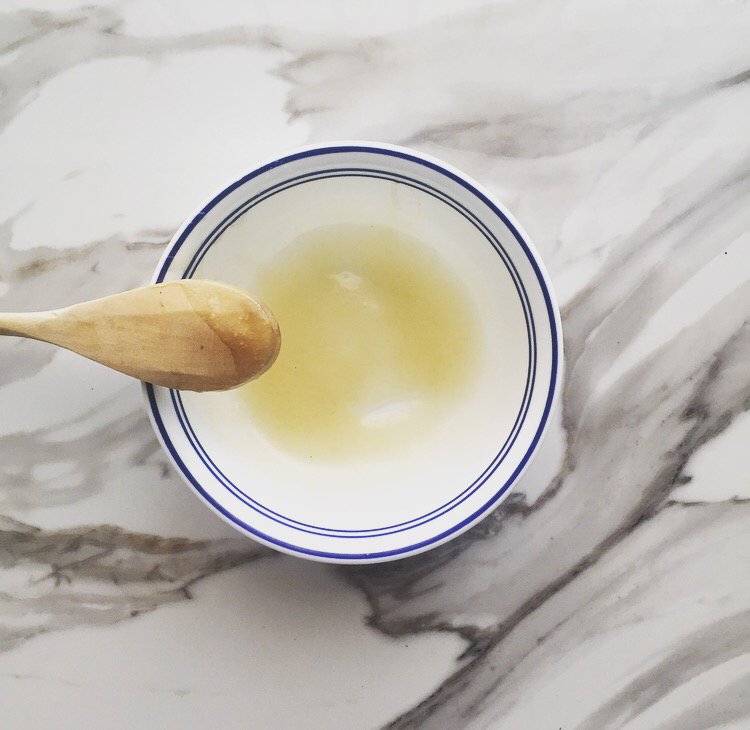 It can be used as makeup remover, ward off stretch marks, rub around the cuticles, or just simply applying it on your skin . Oatmeal is perfect to use as an exfoliating scrub, you can relieve itchy or dry skin by scrubbing it where needed. If you also want glowing smooth skin, apply a cup of ground oats into warm bath water and soak in it for 15 minutes and it will leave your skin incredible. If you have dry skin, avocados help nourish the skin such as the elbows or knees helps to rejuvenate the skin. Avocados contain natural oils and healthy fatty acids that are great for using it as a facial and for your hair. Applying avocados to the hair and scalp for hydration and frizz control. Eggs are perfect to use as an all natural beauty remedy. By applying egg whites on your eyelashes they make them fuller and longer. By applying egg yolks onto your nails it strengthens them and prevents them from splitting/cracking. Also using the shell of an egg is great for the skin. If you crash them into a sandy texture, and then exfoliate your body from head to toe. Sugar is also a great use to help exfoliate the skin. It’s a great lip scrub to exfoliate and heal chapped lips. If you have really embarrassing tan lines that you want to get rid of simply scrub your body with sugar to remove the excess of the tan lines and leaving you with healthy glowing skin. Another natural oil that is great for your skin is almond oil. Almond oil contains vitamin E that helps fight fine lines and wrinkles on your skin that helps to rebuild the collagen in your skin. After applying the almond oil on your skin, it will begin to look brighter and more youthful. So lately I have been in a bit of a skin care craze and I still do love my makeup dearly but the key to having a flawless makeup look is by having flawless skin. I prefer to do my skin care routine during the night because your skin absorbs the nutrients that it is given to and there is no makeup put into it right after like a morning skin routine. LEFT-Simple SkinCare Foaming Cleanser, I absolutely love this stuff not only is it lightweight but it is 100% natural. It has no harsh chemicals, nothing artificial, and includes multi-vitamins that your skin needs on a daily basis. If you have extremely sensitive skin you can check out there entire skin care line it is dedicated for sensitive skin. After I finish washing the dirt and oil from my face I like to have a little extra deep cleaning because there is always residue left over no matter what so I like to use Sea Breeze and what this product is basically like witch hazel just with a different label to it. It deep cleans the trapped oil and makeup that the face wash couldn’t reach. A daily moisturizer is an essential for ALL skin types! No matter if you have oily to combination skin moisturizing your skin is a must. I always liked using the Aveeno daily moisturizer because it doesn’t irritate my skin and it doesn’t irritate my eyes if i get some on it by accident. It is always better to get a moisturizer without scent because, that means it has chemicals that may harsh your skin depending on how sensitive it is. If you have any questions regarding the list of skin items that I just posted, leave a reply at the bottom. How to get rid of dis-coloration/ Acne scars !!! I have battled with acne and especially acne scaring , TRUST ME WHEN I SAY I HAVE TRIED EVERYTHING LITERALLY EVERYTHING IN THE COUNTER , DRUGSTORE AND EXPENSIVE SKINCARE . At the end of the day the most natural products are the best and i had to learn the hard way . 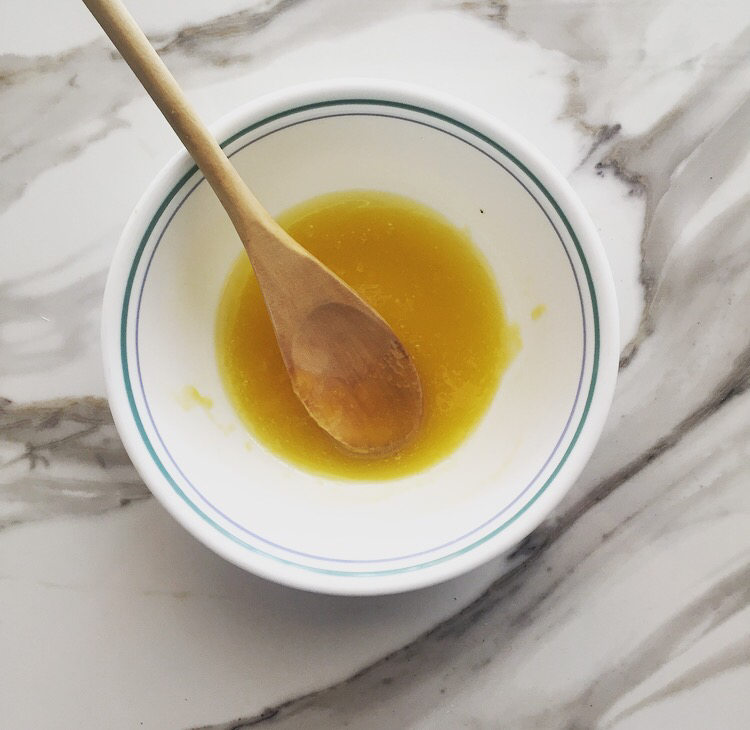 This skincare recipe i learned from my mom that lightens your skin trust me and i will be saying this ALOT but i have had the WORST acne ever and this recipe really helped and my skin not only that but it boosted up my confidence , i stopped wearing so much sweaters and cover ups because i didn’t like the way they looked . You can think in your mind that you have the worst acne scaring and think there is no way of getting rid of it . HAVE NO FEAR THE RECIPE IS HERE : All you need is 3 simple ingredients ! 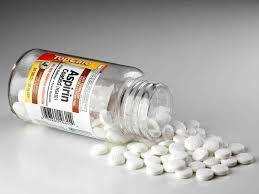 – Grab a plate put all the ingredients together & small the aspirin tablets . – Stir all the ingredients together until you start to see the lemon with the baking soda and aspirin turning into a foamy texture . – Leave the paste on for as long as you can , i would say for about an hour : the longer you leave it on the better results you get ! TRUST ME YOU WILL SEE RESULTS DOING THIS ONLY 1 TIME ! ANOTHER TIP : I would definitely do this every 3 days ; the more you do this the better and faster results you will see on you skin ! Hope this helps many of you guys !